As with the second quarter GDP, productivity (output per person hour) also rebounded. Second quarter productivity growth was up 2.5%. This is better than expectations and a considerable improvement from the 4.5% decline in the first quarter. Unit labor costs, which account for the majority of business costs, edged up 0.6% after surging 11.8% (annualized rate-poor weather induced) in the first quarter. This indicates less cost pressure than expected. The manufacturing sector surged higher in June following a weak May with new orders up a much higher than expected 1.1%. This followed a downwardly revised 0.6% decline in May. The Institute for Supply Management’s index for the non-manufacturing sector grew in July for the 54th consecutive month. The index stood in 58.7. This is up from 56.0 in June. Any reading of 50 or above indicates expansion. Consumer credit rose at a 6.5% annual rate in June. It was driven once again by the non-revolving component (mainly autos and student loans) which grew at an 8.4% annual rate. Revolving credit (mainly credit cards) grew at a 1.3% annual rate indicating that outside of replacing autos and going to college, consumers remain reluctant to take on debt. After rising to its highest level in six years in April, the Arizona Consumer Confidence Index subsided modestly from 75.1 to 71.6 (see chart below). Confidence declined in both Greater Phoenix and Greater Tucson but rose in rural counties. Last week, mortgage bonds hit their highest levels in 2014, helping home loan rates reach some of their lowest levels this year. Read on for details. One of the main reasons bonds and home loan rates have benefitted of late is due to safe haven trades, meaning that when there is uncertainty in the world, like the current situation in Ukraine, investors often move their money out of stocks and into less risky assets like bonds. This includes mortgage bonds, the type of bond on which home loan rates are based. As tensions have escalated overseas in recent weeks, our bond markets have improved—and as mortgage bonds improve, so do home loan rates. Another factor helping bonds right now is the old trading adage, “sell in May and go away.” Stock prices have been declining, helping mortgage bonds improve. The index of leading indicators continues to expand. The index now stands at 101.4, up from 101.0 in March and 95.8 a year ago (see chart below). That represents a gain of 5.8% over the last year. 30-year mortgage rates declined to 4.14% for the week ending May 22. That’s down from 4.33% a month ago and 4.20% last week. A year ago, the 30 year rate was 3.59%. Existing home sales increased for the first time this year in April, while inventory meaningfully increased and home price growth weakened. Total existing home sales rose 1.3% to a seasonally adjusted 4.65 million in April from 4.59 million in March. This is below the 4.99 million pace from a year ago. The median price, at $201,700, was 5.2% above April, 2013. April new home sales were up an unexpected 6.4% from March. However, they are down 4.2% from a year ago. Keep in mind that March was a weak month. The supply of new homes remains scarce at 5.3 months’ supply. This actually is a negative for sales because the selection is not large. According to the National Association of Home Builders Opportunity Index, affordability is still very strong. The Index is now at 65.5. That means that 65.5% of homes sold are affordable to families earning the local median income. Economic news continues to be positive on virtually all fronts. The economy now seems to be benefiting from pent up demand caused by the extreme winter. In addition, it is normal for the economy to pick up strength at this stage of the cycle. So far, so good for the spring thaw. Initial claims for unemployment continued to show good results. This is the second week in a row that initial claims were just slightly above 300,000. This is 13.9% below a year ago and bodes well for the unemployment rate over the near term. Consumer prices were up 0.2% for the month and now stand a modest 1.5% above a year ago. The core rate of inflation (all items less food and energy) was up 1.6% from a year ago. Industrial production in March topped expectations on utilities but the manufacturing component was also healthy. Industrial production advanced 0.7% following a gain of 1.2% in February. It now stands 3.8% above a year ago. This is a healthy gain. Capacity utilization rose 0.5% in March and now is up 1.5% from a year ago. At 79.2, the index now is approaching levels that historically have been associated with increased spending by businesses on new plant. Retail sales grew 1.1% in March after rebounding 0.7% in February. Much of the advance came from motor vehicles which jumped 3.1%. Excluding motor vehicles, sales increased a healthy 0.7% in March. Total retail sales now stand 3.7% above a year ago. The manufacturing and trade inventories/sales ratio kept stable in February at 1.31. This is the same level as January but up from 1.28 a year ago. This indicates that inventories are in line with sales and that manufacturers are not likely to cut back on production. Housing starts picked up in March but not as much as expected. However, strength was in the single family component while it was expected to be in the multifamily component. Single family starts were up 1.9% from a year ago. While this is anemic given the extent of the decline during the recession, at least it is a step in the right direction. The state’s unemployment rate remained unchanged at 7.3% in March. The U.S. rate was also flat in March at 6.7%. A year ago, the Arizona rate was 8.0% and the national rate was 7.5%. In March, the state gained 47,400 jobs compared to a year ago. This is a 1.9% growth rate. Greater Phoenix gained 39,900 jobs over the year ending March for a 2.2% growth rate. Greater Tucson grew by 3,100 jobs or a 0.9% gain. The largest numerical gains were in Education and Health services, Trade, Transportation and Utilities, Financial Activities, Professional and Business Services, and Leisure & Hospitality. While the U.S. has regained virtually all the jobs lost in the last recession, the state has regained just 57% and Greater Phoenix has regained 63%. This is because the decline in Arizona was greater and the recovery started later than in the U.S. as a whole. For the first 3 months of the year, Arizona is 12th out of 50 states in terms of percentage growth in jobs (see chart below). Greater Phoenix is 11th out of 27 major employment markets in the U. S. for the same period. While this is satisfactory, it is well below the ranking the state and Greater Phoenix usually hold at this point in the business cycle. Enplanements at Sky Harbor were up 2.6% in February compared to a year ago while deplanements were up 3.2% versus a year ago. Total traffic was up 2.9%. According to RealData Inc., the number of multifamily units in apartment complexes of at least 50 units in Greater Phoenix rose 2.2% to 266,387 as of the first quarter of 2014. Vacancy was 7.9% compared to 8.8% a year ago and 7.8% in the 4th quarter of 2013. Rents were up 2.4% from a year ago. Only minor changes are being realized in the economic data on a month-to-month, or ever a quarter-to-quarter basis. Expect home price appreciation to remain sluggish for the first half of the year or so. The very cold winter months are now turning into warmer, more productive months. This will add to economic activity and should be seen in the numbers shortly. Improvements in employment and output should help to further strengthen the recently improving consumer confidence readings. In March, the composite index for consumer confidence was a higher than expected 82.3, up from 78.3 a month ago. “Normal” is benched at 100. The University of Michigan index has held steady and remains at 80.0. Manufacturer’s new orders for durable goods rebounded 2.2% in February, following a decrease of 1.3% in January. Over the year, durable orders slowed to 0.2% growth in February. As of February, year-to-date durable orders increased 2.2% over the same period last year. New home sales in February decreased 3.3% from a month ago, and are 1.1% below the February 2013 estimate. For Arizona, the employment figures are picking up where 2013 ended with a 2.1% rate of growth through February. Eight of the eleven major sectors reported job gains while three sectors reported job losses (manufacturing, other services, and government). 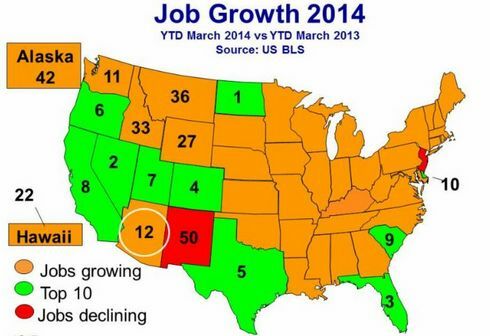 Through February, Arizona ranks 11th nationally in terms of employment growth. As the charts below show, Greater Phoenix has now regained 63% of the jobs lost during the recession. The state as a whole is lagging slightly with 56% recovery. The S&P/Case-Shiller Home Price index for the Phoenix market declined 0.2% over the month but was up 13.8% from a year ago. Leading indicators continue to rise despite temporary weather effects. They were up 0.3% in January compared to December and were up 5.7% over a year ago. This is a good performance (see chart below). Consumer prices grew by a modest 0.1% in January and now stand only 1.6% over a year ago. This is slightly below the Fed’s 2.0% target rate. Initial claims for unemployment insurance are down 6.4% (4-week moving average) from a year ago. This signals that the unemployment rate is likely to continue its slow decline. 30 year mortgage rates continued to be steady last week at 4.33%. New single family starts were down 6.7% from a year ago in January. This decline is largely due to the extreme cold of January. Single family permits were actually up 2.4% over a year ago in January. Slightly lower median home prices and a slight uptick in mortgage rates contributed to housing affordability holding steady in the fourth quarter. In all, 64.7% of new and existing homes sold in the quarter were affordable to families earning the U.S. median income of $64,400. This is virtually the same as the third quarter (64.5%) but down from 74.9% a year ago. The rate of decline in monthly unemployment claims has flattened out over the past few months. Initial claims are now only 7.3% below a year ago. The rate of decline up until recently had been running in the double digits. This suggests only modest improvement in the unemployment rate. Arizona retail sales were up a strong 16.9% in December over a year ago. The lion’s share of the gains was in autos and light trucks. Maricopa County retail sales for December 2013 were up 21.9% over December 2012. Lodging performance for both the state as a whole and for Metro Phoenix continued to show improvement. Occupancy for the state in January was 57.1% compared to 54.5% a year ago. In Metro Phoenix, occupancy was 63.9% compared to 61.3% a year ago. The gains were due to stronger demand as supply was essentially flat. The most often asked question over the past few weeks is about the local housing market. R.L. Brown’s data indicates that the number of new home permits in Greater Phoenix was down 26.8% in January compared to a year ago. In Greater Tucson, the decline was 18.5%. What happened? Was it an even lower rate of population growth? Was it the change in the maximum level of an FHA loan? Was it that the uncertainty over Dodd-Frank has caused private lenders to avoid the mortgage market? Was it the change in affordability from a year ago? Was it the weather back east? Was it the retrenchment of investors in the single family market? Was it simply an aberration? Anecdotal evidence suggests that traffic was up, but conversion of traffic to sales was slow. Some builders also express concern over the effects of the lower loan limit and the unintended consequences of Dodd-Frank. The level of job creation seems to indicate that population growth should continue at a modest level. The fact is that no one knows for sure at this point. But, the answer will become clearer over the next couple of months. National Economic Update ~ What Will The Economy Look Like For 2014? 2014 will be a breakout year for the U.S. economy as private-sector demand accelerates and fiscal drag eases, according to the Economic Advisory Committee of the American Bankers Association. • According to the committee, which includes 13 chief economists from among the largest banks in North America, inflation-adjusted GDP growth for 2014 will be 3.0%, compared to a 2.3% annual average since the Great Recession ended in mid-2009 and the post-recession high of 2.8% in 2010. • The bank economists believe the housing market will continue to grow in 2014 as wages increase and the unemployment rate continues to fall. The group sees the housing sector gaining strength as home sales recover from depressed levels. The committee forecast is that home prices nationwide will rise solidly and residential investment will increase 12.3% in 2014. The strengthened housing sector will support consumer spending.”When families get into new homes, they spend more on appliances, furniture, electronics and building material,” says Low. • Consumers are also finding themselves on stronger financial footing in the New Year and have regained confidence. The group believes consumer spending will support economic growth over the year ahead. Automobile sales are also expected to remain strong. • As the recovery improves, the group believes underlying drivers of economic growth will broaden beyond housing and consumption. Business spending and exports should also be stronger in 2014. • The fiscal environment will be friendlier in 2014 and will exert less drag on consumers and businesses over the course of next year. • Job growth will accelerate from near 180,000 per month last year to over 200,000 monthly in 2014, according to the bank economists. • The committee expects the Federal Reserve to maintain a very accommodative policy stance, keeping the federal funds rate extremely low. It appears that the economy is mildly accelerating and that much of the drama caused by increases in taxes and budget fighting combined with questions over how much the Fed would cut back on its bond buying program is over for now. In addition, stronger consumer spending combined with a run up in business inventories and higher levels of spending by business on software allowed the third quarter real GDP numbers to come in at a healthy 4.1%. More details on the week’s data are below. This will have to hold you over until the MMQ returns from its holiday break in two weeks. Corporate profits were reported to be very strong in the third quarter and now are at record highs in terms of absolute levels and as a percent of real GDP. Net cash flows were also at high levels. This is a positive as it will most certainly lead to more hiring and investment. Leading indicators continued to rise in November and now stand at 98.3 compared to 97.5 in October and 93.4 a year ago. The consumer price index for all urban consumers was reported to be up in November by only 1.2% from a year ago and was unchanged from October. This is below the Fed’s target of 2.0%. The Fed is keeping an eye on this because it is concerned about deflation-a decline in prices. Such an event would probably cause consumers and business to delay purchases and would make it more onerous to repay previously accumulated debt. Industrial production continued to increase in November and is now 3.2% above year earlier levels. While utilities output was up significantly, manufacturing was also quite healthy. Because of this, capacity utilization in November increased to 79.0, up from 78.2 in October and 77.9 a year ago. This is good news as capacity levels are getting closer to the point where business will be spending more on new capacity. That would result in more hiring. 30 year fixed mortgage rates averaged 4.47% for the week ending Dec. 19. This is up from the previous week when it averaged 4.42% and a year ago when it averaged 3.37%. New housing seemed to be doing better nationally than in Arizona in November and December. The U.S. NAHB housing market index increased in December to 58 from 54 in November and 47 a year ago. In addition, nationally, single family building permits were up in November (29.6%) compared to year earlier levels. Local data will be reviewed below. Nationally, existing home sales fell in November. CoreLogic reported that 13.0% of home owners who had a mortgage were under water as of the third quarter of 2013. This is down significantly from the 22.0% who were under water a year earlier. The most important economic news locally was on the employment front. For the state, the unemployment rate (seasonally adjusted) dropped from 8.2% in October to 7.8% in November. The U.S. seasonally adjusted rate declined from 7.3% in October to 7.0% in November. Yet, over the last year in Arizona, the entire decline in the rate was due to a drop in the size of the labor force rather than gains in the number of people working. For the state, 47,500 nonfarm jobs were added in November compared to a year ago. This is a gain of 1.9%. Nine of the eleven major sectors reported gains. Only government and manufacturing shed jobs. Through November, the state now ranks 7th in terms of employment growth out of the 50 states. In Greater Phoenix, the unemployment rate now stands at 6.0%. Over the last year, the area gained 41,600 net new jobs, a gain of 2.3%. The largest gains were in education and health services, trade, transportation & utilities, financial activities, professional & business services, construction, and leisure and hospitality. Only government, manufacturing and mining declined. The Greater Phoenix area now ranks 7th out of 28 major employment markets in the U.S. this is up from last in 2010. Retail sales in the state were up 7.2% in October from year earlier levels. In Maricopa County, retail sales were up 11.4%. The increase was across the board with the exception of construction, and wholesale. The largest gains were in motor vehicle dealers and miscellaneous retail. The government shutdown weighed heavily on the minds of consumers as the confidence index dropped from 80.2 in September to 71.2 in October. The index now stands below levels reached a year ago. National retail sales for September declined 0.1% from last month, but, are 3.2% above a year ago. This is a sign of weakness going into the Christmas season. Sales of light vehicles and trucks fell a sharp 5.2% in September following a 1.9% rise in August. The drop was led by domestic trucks, down 7.5%. Domestic cars were down 5.1%. Import autos were down only 1.8%. Consumer prices were up 0.2% in September vs. August and now stand a modest 1.2% over a year ago. This is good news and bad news. The bad news is that the modest increases are below the Fed target of 2.0% and reflect very weak domestic demand. Growth in industrial production topped expectations in September. But, it was all about atypically cool weather. Manufacturing was still flat. Overall, industrial production was up 0.6% following a rise of 0.4% in August. The gain was primarily due to a surge in utilities as cool weather boosted utility demand. Capacity utilization rose to 78.3% from 77.9% in September. While this is an improvement, it is still below the 80% that has historically been associated with increases in plant spending. According to the Institute for Supply Management, manufacturing expanded in October for the fifth consecutive month and the overall economy grew for the 53rd consecutive month. Pending home sales declined for the fourth consecutive month in September as higher mortgage interest rates and higher home prices curbed buying power. The Pending Home Sales Index, a forward looking indicator based on contract signings, fell 5.6% to 101.6 in September from a downwardly revised 107.6 in August. The index is at the lowest level since December 2012. According to the S&P/Case-Shiller home price index, home prices continued to climb nationally. Both the 10 and 20-city indices were up 12.8% over a year ago and 1.3% in August vs. July. According to data compiled by Fletcher Wilcox and the Cromford Report, it appears the major disruptions in the Greater Phoenix home market is near an end. September foreclosure starts were below 2006 levels. Auctioned properties were the lowest since 2006. Short sales were the lowest since 2007. Virtually every indicator of disruption was down significantly. According to CBRE, the Greater Phoenix office market continues to improve. For all three quarters of 2013 reported, absorptions significantly exceeded change in inventory. Thus, vacancy rates are down 1.7 percentage points over the last year. While vacancies are still very high by historic standards, they are moving in the right direction. The same is true in retail markets where vacancies are down 0.8 percentage points over the past year and are approaching 10%. Industrial markets are more mixed as change in inventory for the first three quarters of the year exceeded absorption by over 1 million square feet.